The Sí is the supernatural or parallel world of Irish, Scottish and Manx mythology and folklore. It’s literary form was derived from pre-Christian Gaelic and Celtic beliefs about the afterlife and its inhabitants, filtered over a period of centuries through a process of assimilation by various schools of religious scribes in the early Medieval Church of north-western Europe. In the Irish language the word Sí (Old/Middle/Early Modern Irish Síd/Sídh, Modern Scottish Sìth) has two broad but linked meanings. The first – and probably oldest – is Sí “(the) Otherworld”: that is the subterranean world of the Tuatha Dé Danann and Aos Sí in the literary traditions of Ireland, Scotland and the Isle of Man. This was originally the abode of the gods and their opponents in the pre-Christian religion of the Gaels (hence the frequent Latin notations in the Medieval manuscripts describing the Tuatha Dé and Aos Sí as “gods of the earth”). However it was also a type of afterlife for mortals, normally heroic ancestral figures or those favoured by the gods. The Otherworld itself was reached through ancient burial mounds and caves, lakes and springs, or more supernaturally via sudden mists or visions (c.f the archaeological evidence throughout the Celtic world of presumed votive offerings deposited in the ground and in shaft-pits, bogs and lakes – gifts to the gods below?). Later it became associated with faraway islands reached by boat or ship. While this latter method has been attributed to Classical (Greek and Roman) influences during the Christian literary era it likely also represents a continuation of native traditions and these islands may have been a manifestation of the undersea aspects of the Otherworld. In Irish, Scots and Manx folklore mysterious coastal or overseas islands became a much more prominent feature of supernatural tales (especially those from Ireland). The second – and later – definition of Sí is “Otherworld Residence, Territory” (pl. Síthe “Otherworld Residences, Territories”). These Síthe were regarded as the Otherworld homes of the Tuatha Dé Danann and Aos Sí, while also providing access to their supernatural lands. They were both part of yet separate from the Otherworld as a whole, and in the literature and folklore often represented the dwellings or kingdoms of particular members of the Otherworld community; and presumably at one stage the most prominent native gods or goddesses. The majority of Síthe were equated with the ancient burial mounds and graves that dotted the landscapes of Ireland, Scotland and Mann (though the term was sometimes applied to other areas associated with the supernatural like notable hilltops, caves, springs, lakes and certain wilderness locations). Most of these prehistoric monuments (classified by Irish archaeologists in chronological order as court tombs, portal tombs, passage tombs and the long lasting wedge tombs) dated from the broad middle of the Neolithic Age, between 4000 and 3000 BCE. Their funeral purpose seems to have been communal in nature with interments over long periods of time and from this must have grown the ancient belief that such monuments were the dwelling places of ancestral kings or heroes – and later the gods themselves. Of course those who constructed and used the burial mounds were the ancestors of the peoples who were eventually to emerge from the agricultural, maritime and trading communities of coastal western Europe during the so-called Atlantic Bronze Age as the Celts. However by the time Christianity and literacy reached Ireland and the other Gaelic nations the memory of those who built the mounds or what they contained was inevitably forgotten or evolved into new oral traditions. It’s likely that the concept of the Tuatha Dé and Aos Sí living in different residences or territories within the Otherworld reflected the division of Ireland and Scotland into separate kingdoms and lordships during the late pre-historic and early Medieval periods. 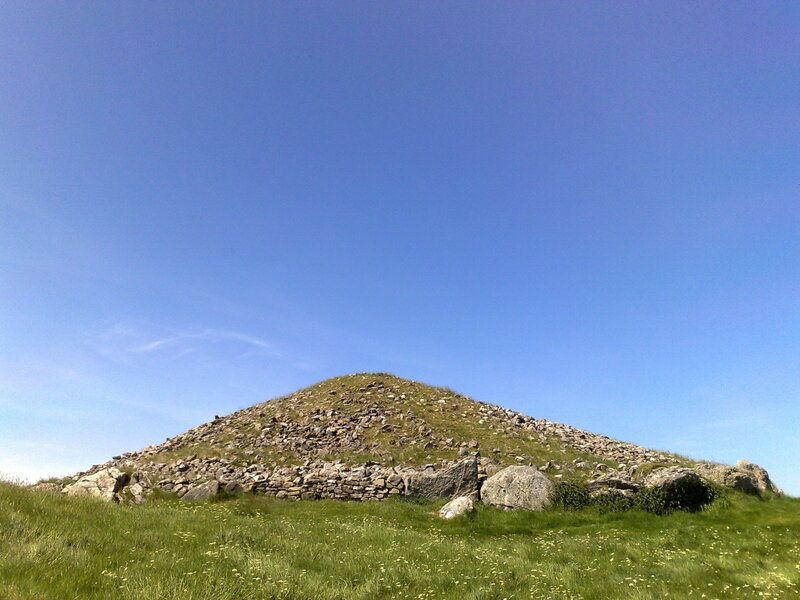 The belief may have been given impetus by the widely spaced locations of the burial monuments regarded as Síthe, suggesting an obvious equivalence with the widely-spaced homes and fortresses of the kings and lords in the mortal world (especially if the great mounds were originally thought of by those peoples or tribes living around them as the abodes of their deceased ancestors). In a sense the Otherworld became an idealized version of the human world, distinguished by the supernatural aspects of its inhabitants, creatures and lands. These many layers of interpretation mean that the translation of the word Sí in the literature or folklore is often dependent on context, with many semantic ambiguities, though it should be noted that Aos Sí is simply the “People of the Otherworld Residences, Territories” (which can be glossed in English as the “Otherworld People, Folk”). As for the word itself the linguistic origins for its development seem fairly clear. We can begin with an Indo-European stem *sed- “to sit” which evolved into a Celtic *sedos “a residence, dwelling, settlement”. This then took on the special meaning of the “residence, domain of the gods” (i.e. the Otherworld) reflected in its later Irish form, the word Síd. That term then took on a dual meaning allowing it to refer to a specific “Otherworld residence”, as shown in the Old, Middle and Early Modern Irish word Sídh. That double-meaning is retained by the Modern Irish Sí though many users are unaware of its wide range of possible interpretations. The Otherworld or Sí, while the domain of the gods and other supernatural beings, was also the world of the spirits of the dead: that is, in crude terms, the Celtic afterlife. It was where one’s ancestors dwelt after death and distorted memories of the role of the ancient burial monuments must have contributed towards this belief. However in the recorded literature those mortals who visit or stay in the Otherworld are famous figures: legendary heroes and kings. Could it be that the Otherworld was not available to the ordinary people as a whole? Did they face a slightly less luxurious afterlife or no existence at all after death? Since early Irish and Scottish texts are mainly concerned with the lives of the aristocratic classes and their ecclesiastical peers it is difficult to know how much they reflect wider assumptions held in the pre-Christian societies of Ireland, Scotland and Mann – especially as they are bequeathed to us through a Christian filter. It could be that one of the attractions of the new Christian religion for Irish, Scots and Manx converts was the promise of eternal life for all believers, regardless of one’s economic circumstances or status in wider society. The theory that Christianity initially began in the Gaelic nations as the faith of the lower classes (beginning with slaves from Roman Britain and Europe) may be apropos here. Though it should be remembered that the qualifications for nobility amongst the Gaels were not simply about one’s bloodline or family but were instead more concerned with the possession of property and the system of clientism. As an Irish legal maxim has it, “A man is greater than his birth”, and commoners and nobles could rise and fall in status, and almost certainly did so. It may be then that the ordinary people of Ireland, Scotland and the Isle of Man outside the aristocratic families or learned classes could also expect a life or continued existence in the world beyond, though perhaps one less exalted than that of their social superiors. Unfortunately it seems that the exact nature of the Celtic afterlife will remain one of several crucial areas of religious thought from pre-Christian Ireland and Scotland that (along with the beginning and end of the world) are lost or beyond conclusive reconstruction. It is worth noting here that the Irish word for “Heaven”, Neamh, though now understood to refer to the Christian afterlife may originally have had a non-Christian meaning or association. However this is a matter of (considerable) debate and nowhere in the early secular or religious literature of the Gaelic nations is the Otherworld referred to as Neamh.